For other units with the same regimental number, see 101st Regiment of Foot (disambiguation). The 101st Regiment of Foot (Royal Bengal Fusiliers) was a regiment of the British Army raised by the Honourable East India Company in 1652. It transferred to the command of the British Army in 1862. Under the Childers Reforms it amalgamated with the 104th Regiment of Foot (Bengal Fusiliers) to form the Royal Munster Fusiliers in 1881. The regiment was raised by the Honourable East India Company as a Guard of Honour in 1652. In December 1756 it was renamed the Bengal European Regiment – "European" indicating it was composed of white soldiers, not Indian sepoys. It saw action at the Battle of Plassey in June 1757, the Battle of Condore in December 1758 and the Siege of Masulipatam in March 1759 during the Seven Years' War. It also fought at the Battle of Buxar in October 1764 during the Campaign against the Mughal Empire. The regiment was renamed the 1st Bengal European Regiment, on formation of the 2nd and 3rd Bengal European Regiments, in 1765. It went to take part in an action at Rohilkhand in April 1774 during the First Rohilla War. It fought at the Battle of Sholinghur in September 1781 during the Second Anglo-Mysore War and at skirmishes around Gujarat in 1782 during the First Anglo-Maratha War. After that it took part in an action at Rohilkhand in October 1794 during the Second Rohilla War. The regiment went on to fight at the Battle of Deeg in November 1804 during the Second Anglo-Maratha War. Two companies were deployed to Macau in September 1808 but returned in December 1808. A detachment went to the Dutch East Indies in 1810 and another to Nepal in 1814. The regiment saw some combat in skirmishes with the Pindaris in 1817 during the Third Anglo-Maratha War. After that it took part in operations against the Jat people in December 1825 during the Siege of Bharatpur. The regiment was deployed to Afghanistan in 1838 and saw action at the Battle of Ghazni in July 1839 during the First Anglo-Afghan War. Renamed the 1st Bengal (European) Light Infantry in 1840, it fought at the Battle of Ferozeshah in December 1845 and the Battle of Sobraon in February 1846 during the First Anglo-Sikh War. It became the 1st Bengal European Fusiliers, also referred to in contemporary official papers, with inverted word ordering, as 1st European Bengal Fusiliers, in April 1846. It was deployed to the Province of Pegu in April 1852 during the Second Anglo-Burmese War. On the outbreak of the Indian Rebellion the order to march on Delhi was issued by Army Command in Shimla, and reached the regiment at Dagshai through Major George Ogle Jacob on 13 May 1857. After receiving the order, the regiment marched down from its rest station at Dagshai and was due to reach Umballa that evening. Jacob was mortally wounded at the Siege of Delhi on 14 September 1857. His grave at Rajpura Cemetery, Delhi states: "Sacred to the memory of Major George Ogle Jacob, 1st Bengal Fusiliers, who whilst commanding his Regiment fell mortally wounded at the storming of Delhi, on the 14th September 1857, aged 38 years. This monument is erected by his family." The regiment went on to take part in the Capture of Lucknow in March 1858. Five members of the regiment were awarded the Victoria Cross for their actions during the rebellion. After the Crown took control of the Presidency armies in the aftermath of the Indian Rebellion, the regiment became the 1st Bengal Fusiliers in November 1859 and then the 1st Royal Bengal Fusiliers in May 1861. It was then renumbered as the 101st Regiment of Foot (Royal Bengal Fusiliers) on transfer to the British Army in September 1862. [Note 1] The regiment took part in the Ambela Campaign in 1863 and then embarked for England in late 1868. It was sent to Malta in October 1874 and transferred to Cyprus in July 1878 before setting sail for Halifax, Nova Scotia in November 1878. As part of the Cardwell Reforms of the 1870s, where single-battalion regiments were linked together to share a single depot and recruiting district in the United Kingdom, the 101st was linked with the 104th Regiment of Foot (Bengal Fusiliers), and assigned to district no. 70 at Ballymullen Barracks in Tralee. 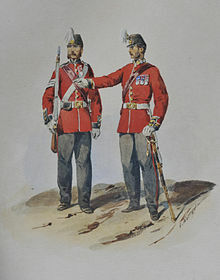 On 1 July 1881 the Childers Reforms came into effect and the regiment amalgamated with the 104th Regiment of Foot (Bengal Fusiliers) to form the Royal Munster Fusiliers. ^ "Her Majesty's Government have expressed an anxious desire to preserve the proud recollections of distinguished service which belong especially to the older Regiments of each Presidency, and to incorporate with Her Majesty's Army, Corps which have so greatly contributed to the acquisition and maintenance of Her Majesty's Dominions in the East. Her Majesty having graciously determined to mark Her estimation of the services of Her Indian Armies, by conferring the designation of "Royal" upon three of the European Regiments, and by selecting for this honour one Regiment from each Presidency...has much gratification in announcing that the following Regiments will henceforward bear the honourable designation of "Royal" Regiments...The 1st Bengal Fusiliers. The...older Regiments in the several Presidencies will thus be converted into Regiments of Her Majesty's General Army, and will be numbered and designated as follows...The 101st Regiment of Foot (Royal Bengal Fusiliers). ^ a b c d e f g h i j k l m n o p "101st Regiment of Foot (Royal Bengal Fusiliers): Locations". Archived from the original on 10 March 2006. Retrieved 25 March 2017. ^ For example in the correspondence of Lt.Col. George Gladwin Denniss(1821-1862) (ed. P. Chantler, South Molton, 2010) who invariably placed the word "European" before "Bengal"
^ "List of memorials from Indian Mutiny". Archived from the original on 7 February 2007. Retrieved 25 March 2017. ^ "No. 22278". The London Gazette. 21 June 1859. p. 2420. ^ "No. 22212". The London Gazette. 24 December 1858. p. 5519. ^ "No. 22260". The London Gazette. 6 May 1859. p. 1867. ^ "No. 22514". The London Gazette. 28 May 1861. pp. 2252–2253. Innes, Lieutenant-Colonel P. R. (1885). History of the Royal European Regiment, now the Royal Munster Fusiliers. London: Simpkin. "101st Regiment of Foot (Royal Bengal Fusiliers)". regiments.org. Archived from the original on 13 January 2008. Retrieved 1 June 2007. This page was last edited on 1 December 2018, at 00:19 (UTC).